It snowed today and now it’s raining but the temp is 26 degrees F. Ever since the ice storm of December 2009, after which we had to clear every fairway again, and my love for chainsawing emerged (it HAD to), every time we get freezing rain, we think about the 2009 ice storm, when it rained for a long time while the temperature stayed freezing, like it’s doing right now. 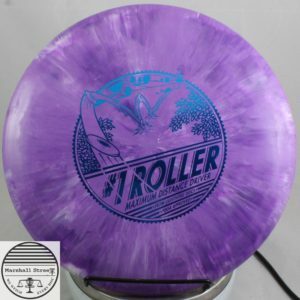 As of this writing on 2/7/2018, Marshall Street has about 42,000 frisbee golf discs, and roughly 22,000 0f these are stock discs. I suppose you could consider them default models, ones with the plastic lines’ generic stamp. These include every disc you can think of: Lucid Judge, Champion Orc, #2 Driver, D3 400G, Atomic Piwakawaka. It doesn’t include Glow or anything dyed or Tourney Stamps or Vintage or a whole bunch of other categories. One reason this is so, is that our in-store system, Intuit Point of Sale, makes us choose one category for each disc and one manufacturer. But on our new website, we can make any disc multiple things. A disc can be Westside Discs, Control Driver, AND Special Stamp. And if it’s a Special Stamp we don’t make it a Stock Stamp, too. But we could if we wanted to be stoopid, and we in fact enjoy being stoopid in our own fashion, but not all the time and not on every possible occasion, and if it’s a Special Stamp or an X-Out or a Natural Beauty, it can’t be a Stock Disc, too. Okay? “Stock Discs” means no extra things. It means this is the disc before its parents mess with it, before the legal system feels compelled to get involved, before it learns to drive. The ESP Nuke is a stock disc; all Ledgestone discs are not stock discs. So can an ESP Nuke be a Ledgestone disc? No, not unless they make a Glow ESP Nuke or an FLX ESP Nuke, or a Special Blend Z-ESP Nuke for a specific Ledgestone Insurance Open, in which case it’s automatically NOT a stock disc. There’ll be a quiz in the morning. On completely different stuff.